Arduino LEDs shield? No Thanks! Today I searched on the web for some LEDs Boards for Arduino. I found a lot of really cool stuff! There was a shield for Arduino with many LEDs using Charlieplexing Matrix, a shield with some RGB LEDs, LEDs displays with thousand LEDs that comunicate with Arduino through the serial port. Many others shields with 7-segments displays, others that drives high-current LEDs, others that makes LED watch, others are LEDs Cubes. If you love LEDs, making games or working with scrolling text, surely you have found these things on the net. But you understand that you always need an Arduino, a shield, a power supply adapter or, if you are lucky, a battery pack. “Just in the size of” … a big box! 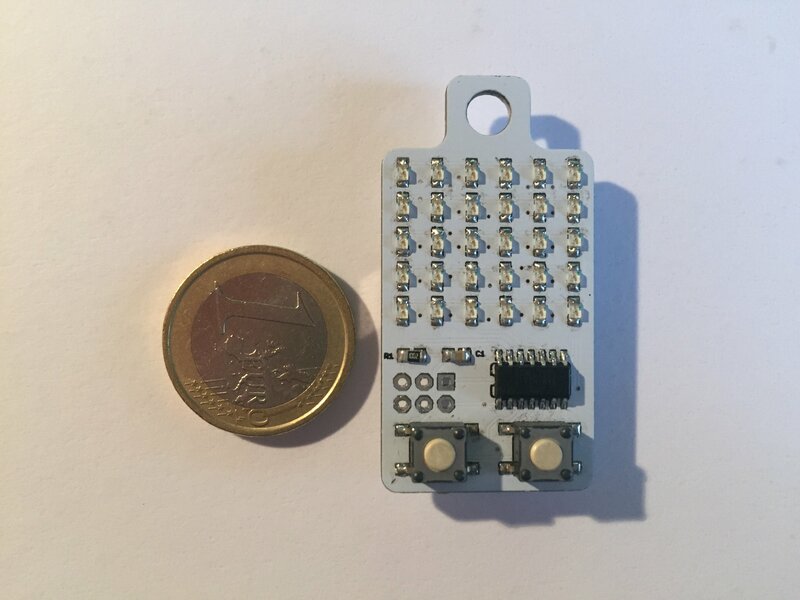 Use KeyChainino, with a 6×5 LEDs Matrix, “in the size of” … a keychain! Forget shields, wires, power adaptors, KeyChainino just works! It has an Attiny84 microcontroller (programmable with Arduino), 30 LEDs, two buttons and a CR2032 battery, all in one board. Do you want to build your own game? Check out the arkanoid sketch, work on it, and apply some changes to make your own original game. Do you want to wish Happy Christmas to your friends? Just check out the scrolling text sketch and build your own text to scroll in the KeyChainino matrix! Otherwise, if you want to make it really simple, subscribe for free to the newsletter and you will receive a special sketch, were you only need to write your own phrase in a string variable and it will be displayed on KeyChainino.